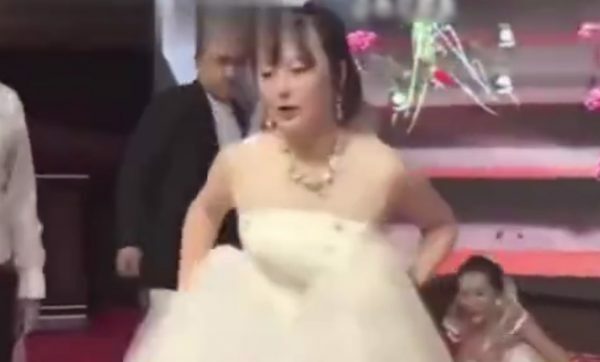 In a video described as too shocking even for television, a woman interrupts the wedding of her ex-boyfriend while wearing her own wedding gown. 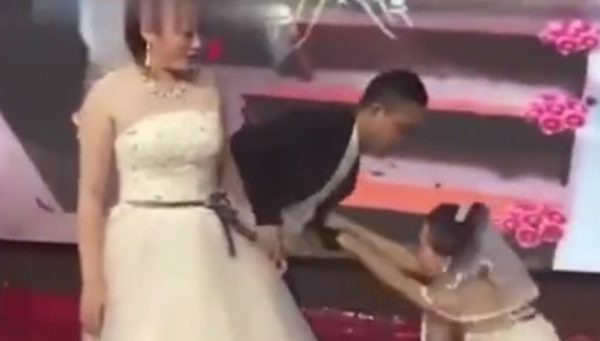 The footage shows a bride and groom stand on stage while a master of ceremonies recites a romantic speech, when suddenly a woman in her own wedding dress attempts to steal the groom for herself. 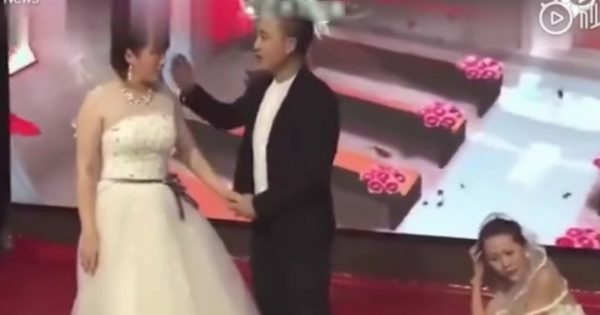 The woman is said to be the groom’s ex-girlfriend, according to an April 6 report by Sina News, an online Chinese news portal. Several online media outlets said that the groom and ex-girlfriend broke up over incompatible personalities. The identity of the individuals in the video were not provided. It is also unknown where and when the incident took place. The video prompted a flood of comments online expressing shock at the ex-girlfriend’s audacious move. The scene starts amid a standard modern Chinese wedding ceremony, which is quite similar to a Western wedding reception. 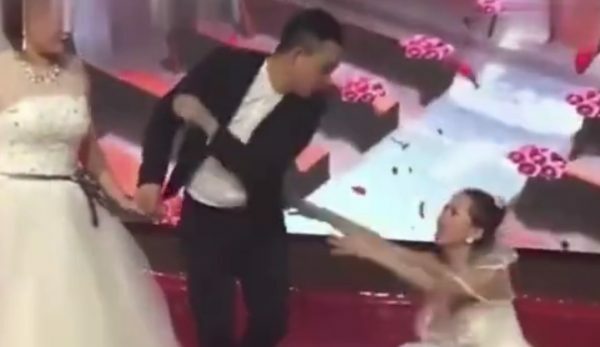 Multiple reports said as the groom was just about to kiss the bride, his ex-girlfriend charges on stage and grabs him by the hand. The ex-girlfriend then squats down, pulls on his hand, and looks up at the groom pleadingly. The groom quickly snatches his hand away from her. In an attempt to salvage the wedding, the groom turns to his bride, smiling at her and comforting her. The ex-girlfriend only pauses for a moment. Undeterred, she then reaches over and this time grabs onto his jacket. The groom turns around abruptly, and backs away from her, while his ex-girlfriend grips tightly. She is dragged to the ground by him pulling away from her. During this whole time, the bride has stood by, watching in silence as this shocking scene unfolds on her special day. Finally she has enough, and yanks her hand away from the groom, and storms off stage. 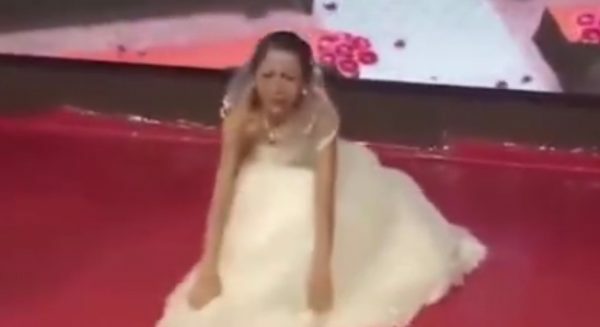 The groom quickly follows behind her, while the ex-girlfriend is left alone on stage in tears. Social media users were flabbergasted by the ex-girlfriend’s brazen attempt to win back the groom. 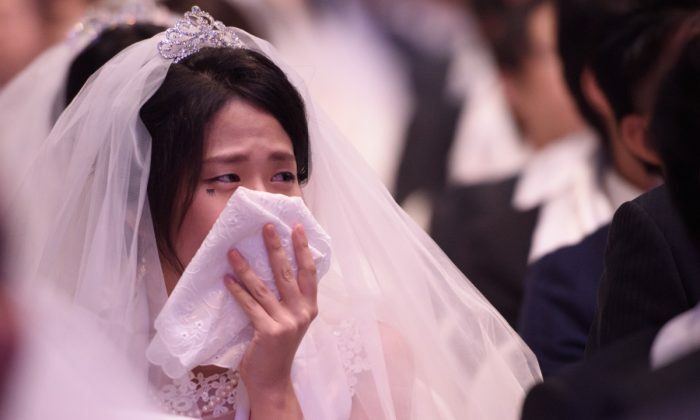 What’s Behind China’s Rising Divorce Rates? The gap between tradition and modernity is a potent, if difficult-to-quantify, influence.